Around 70 major international airlines offer flights to Ben Gurion Airport in Tel Aviv, Israel. The Israeli national airline, El Al, operate direct flights to Israel from most major European and American cities as well as from Africa and the Far East. El Al, Continental, Delta, and US Airways operate up to 10 nonstop flights per day from America to Tel Aviv. Nonstop flights operate from Los Angeles, Philadelphia, New York (JFK) and New York (Newark-Liberty). Air Canada also flies nonstop from Toronto to Tel Aviv, with connections from major Canadian cities. Other Israeli airlines such as Arkia and Israir operate flights from central Europe. The recent Open Skies Agreement will increase the number of flights to and from EU countries at reduced prices by 2018. 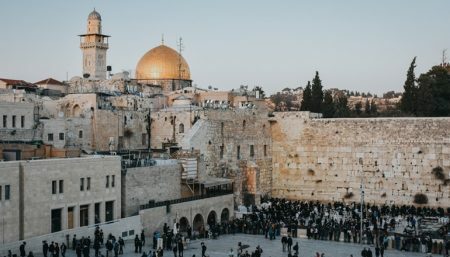 There are no direct flights from distant countries such as Australia or from countries that do not have diplomatic relations with Israel, so it is best in these cases to book a connecting flight. Discount airlines such as Easy Jet now fly from London into Israel’s old terminal (Terminal 1) and often offer cheap flights if you book in advance. It is also worth looking into flights into Eilat’s Uvda airport, though they are mainly charter flights, and you need to bear in mind the five hour bus ride between Eilat and Jerusalem. Israel’s international airport Ben Gurion Airport is situated near the town of Lod, 35 minutes from Jerusalem and about a half hour drive from Tel Aviv. Despite its location, the airport is commonly referred to as Tel Aviv Airport by tourists. Ben Gurion Airport’s security is probably of the highest standard in the world, and you will likely be met with a string of security questions. It is advisable to have a print out of the details of where you will be staying and some form of itinerary. Upon departure, it is advised to check in your luggage at least three hours before flight departure unless you are flying El Al, in which case you have the option to check your luggage in the day before the flight and then show up an hour and a half before the flight. Ben Gurion Airport was completely renovated in 2004 and is ultra-modern, efficient and equipped with duty-shops, restaurants, banks and currency exchange offices. Most airlines fly to and from the renovated Terminal 3 building, apart from European discount airlines such as Easy Jet, which fly to and from Terminal 1, and require that passengers arrive only 1 hour in advance of the flight. Click here to read about getting to and from Ben Gurion Airport. There are no airports in Jerusalem. Those who are interested in flying to Eilat may do so from either Sde Dov airport in Tel-Aviv or from Ben Gurion airport, Israel’s international airport. The benefit of flying to or from Eilat is that it is a quick way of getting there and avoiding traffic. Flights are approximately half an hour in duration. Some choose to fly in one direction and take a bus or rental car in the other for a varied experience. Most tickets can be bought on a one-way basis. There are approximately 15-20 flights to Eilat each day. The two main airlines that provide these flights are Israir and Arkia. Flights range from between $40 USD and $100 USD per direction. Cheaper rates are available for children and infants. You may also choose to purchase an Eilat package deal (details available on the Israir and Arkia websites).